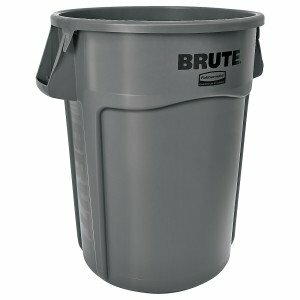 Since 1968, BRUTE containers from Rubbermaid have been trusted by professionals for their iconic durability and reliability. With every lift, drag and drop, they’ve outlasted – and outperformed every competitor in their industry thanks to their proprietary design and the highest quality materials. That’s why the containers are chosen first to get the job done. The BRUTE refuse container delivers improved productivity and efficiency with innovative venting channels that make removing liners up to 50 percent easier. Integrated cinches secure can liners, meaning knot-free liner changes. Contoured base handles improve grip, reduce strain and improve efficiency when emptying containers. For 48 years, the performance of BRUTE containers has been trusted by professionals.